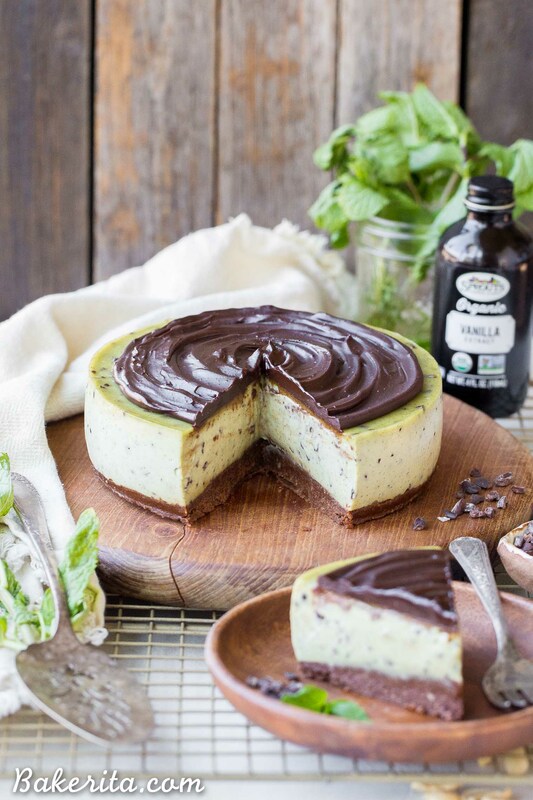 This No Bake Mint Chip Cheesecake is a healthier paleo and vegan cheesecake, made with a creamy cashew base. 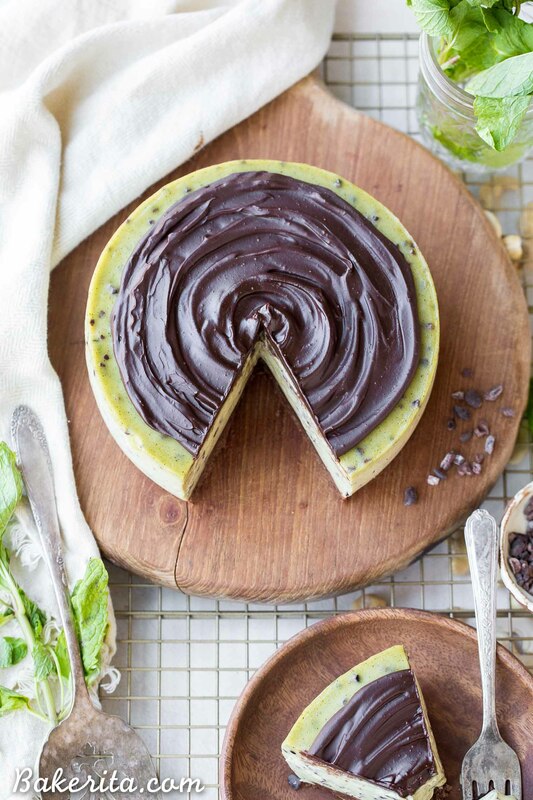 It has a nutty chocolate crust and a smooth and minty filling, with crunchy cacao nibs throughout and creamy dark chocolate ganache on top. This post is sponsored by Sprouts. This post has been a loooong time coming. Like, many many months. I’ve had it written and planned in my head for ages, in part thanks to you guys. At least 3 or 4 months ago, I did a poll on my Instagram stories asking which vegan and paleo cheesecake flavor you wanted to see next. Mint chip was among the options, and it BLEW the others out of the water in terms of requests. As the months went on though, mint chip cheesecake kept getting pushed back onto my calendar to prioritize autumn flavors, like cinnamon and pumpkin everything. But finally, the time for mint chip cheesecake is HERE, because it’s December and time for all the things minty to take their time to *shine*. I recently posted these Chocolate Peppermint Cups and just posted this Chocolate Peppermint Fudge, but this Mint Chip Cheesecake is truly the showstopper of the group. I partnered with my friends from Sprouts for this post, and it’s a very natural fit since I’m literally there every other day stocking up on ingredients. There’s one within walking distance of my apartment and I can always count on them to have all the wholesome ingredients I need. For this post, I hit the bulk bins to stock up on organic cashews and pecans, and grabbed coconut milk, coconut oil, vanilla extract, maple syrup, and fresh mint to round out the recipe. Let’s chat about how it’s done! First, the gluten-free chocolate crust! Like the rest of this recipe, there’s no baking necessary. I used pecans, but any other will nut will work too. I like pecans here for their buttery sweetness, though. The pecans, almond flour, dates, cacao powder, coconut oil, and sea salt are pulsed together in a blender or food processor until a rich chocolately dough is formed, and then pressed into the bottom of a 6″ springform pan. If you want a larger cheesecake, double the recipe and use an 8″ springform pan instead. The mint chip filling is made with a creamy base of soaked cashews. The soaked cashews get super soft and create the most luscious and amazing texture when blended with the rest of the ingredients. Canned coconut milk helps the cashews blend up into smoothness, with maple syrup adding some sweetness, and coconut oil helping the cheesecake to firm up when it’s chilled. A squeeze of lemon juice adds some of tanginess to give a bit of cream cheese flavor. Of course, it wouldn’t be mint chip cheesecake without mint and chips! Vanilla and peppermint extracts are added for flavor, along with fresh mint leaves for bright minty flavor and green color. Crunchy cacao nibs are folded into the thick, minty filling before it’s poured in ribbons over the crust and smoothed out. 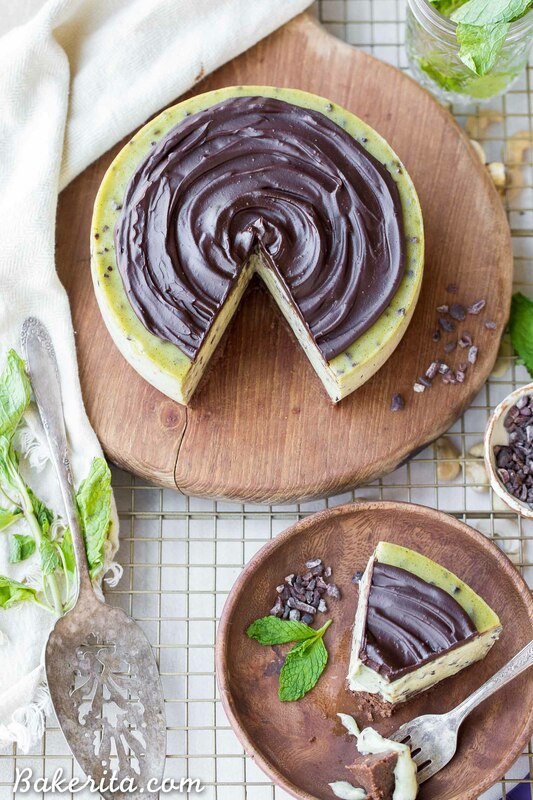 I did try using chopped mint chocolate on a previous test of this cheesecake, but the chocolate melted a bit and turned the whole thing brown. Not cute. You can try using chocolate chunks if you’d rather than nibs, but make sure your filling is completely cool before you stir them in. 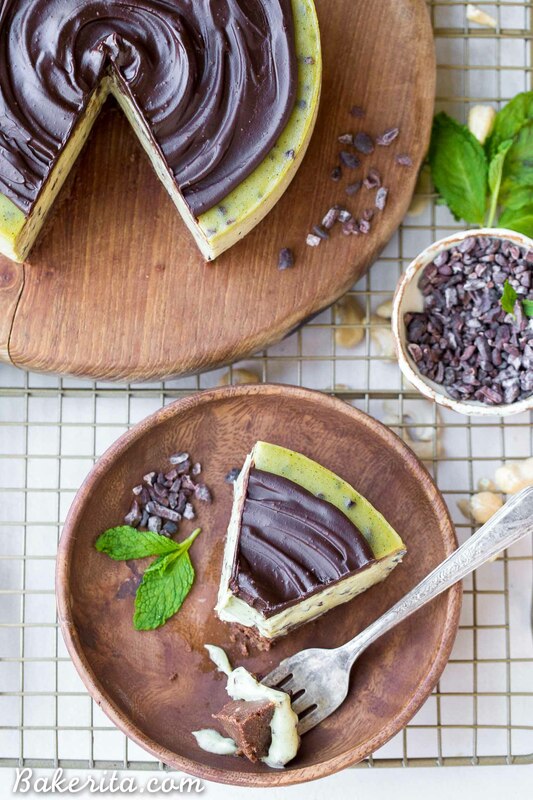 This No-Bake Mint Chip Cheesecake is a easier than you’d guess by looking at it, and will blow your taste buds out of the water. Tis’ the season for everything chocolate and mint, and enjoy this one at your next get-together. Enjoy! 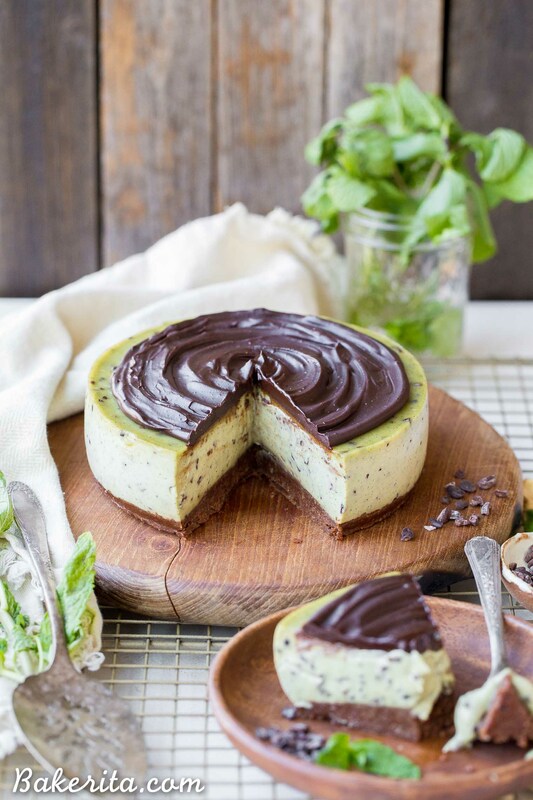 This Mint Chip Cheesecake is a healthier paleo and vegan cheesecake, made with a creamy cashew base. 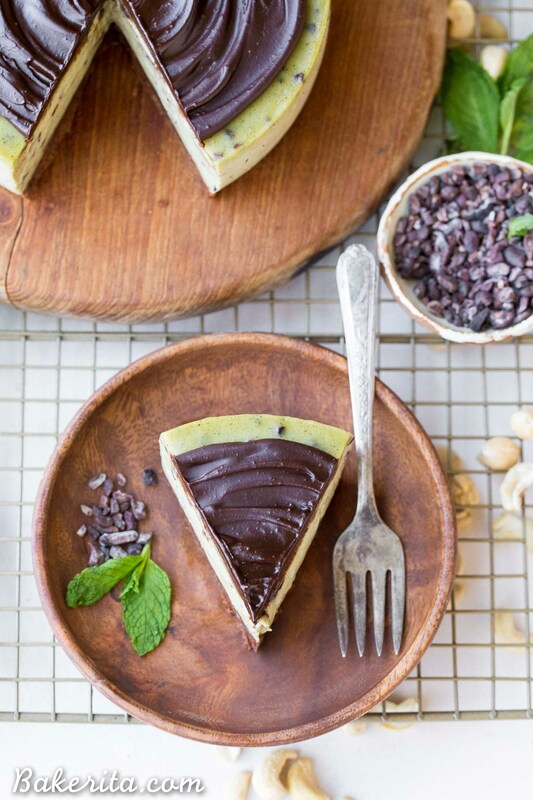 It has a nutty chocolate crust and a smooth and minty filling, with crunchy cacao nibs throughout and creamy dark chocolate ganache on top. Add the pecans, almond flour, pitted dates, cacao powder, coconut oil and salt to a food processor or high-powered blender and pulverize until it comes together into a sort of sticky dough, with small pecan bits remaining. Don’t over process, or it’ll turn into nut butter! Press the date dough evenly along the bottom of the prepared pan. In the same food processor or high-powered blender (no need to wash between - I used my Vitamix, but most powerful blenders should do the job), combine all of the filling ingredients EXCEPT for the cacao nibs and blend for about 2 minutes, or until the mixture is silky smooth and creamy. Scrape down the sides as necessary. You may need to add a bit more coconut milk or lemon juice to get it to blend smoothly if your blender isn’t super high-powered. Once it’s smooth, taste the mixture and adjust the level of maple syrup if you want it a bit sweeter, or add more peppermint if you want it mintier. Add a few drops of natural green food coloring now, if desired. Add the cacao nibs and pulse to blend into the filling, making sure not to blend the cacao nibs in entirely. Serve immediately, or place in the freezer until ready to serve. When ready to serve, let thaw at room temperature for 10-15 minutes before serving. I recommend running your knife under hot water to warm it up before cutting the cheesecake with the still-hot (dried) knife.